The bond between lovejoy families is strong... it represents a community committed to a superior education for kids, a healthy and vibrant community centered around family values and a community already ready to serve others. This year we are introducing the inaugural campus camp out! WE all CARE deeply about maintaining and even enriching the services offered at our schools and to address the recent gap in funding, we are Camping! Prepare for an evening to remember, likely one your kids will look forward to year after year! 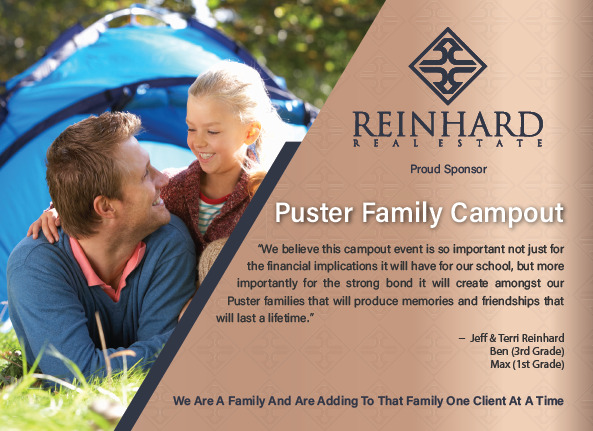 This is an overnight camp out, creating a camping experience at Puster Elementary School for parents and children. This is a fundraising event. All proceeds benefit OUR kids! Reinhard Real Estate is dedicated to providing concierge level service to everyone looking to buy or sell a home. The database information herein is provided from and copyrighted by the North Texas Real Estate Information Systems, Inc. NTREIS data may not be reproduced or redistributed and is only for people viewing this site. All information provided is deemed reliable but is not guaranteed and should be independently verified. The advertisements herein are merely indications to bid and are not offers to sell which may be accepted. All properties are subject to prior sale or withdrawal. All rights are reserved by copyright. Copyright © NTREIS 2019. All Rights Reserved. Last updated April 26 at 2:20 am.